The Estonian U20 national team listens to its national anthem after getting its fourth win in the fourth game. 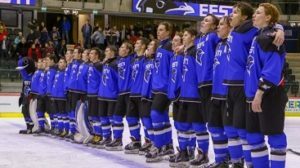 Estonia won the 2019 IIHF Ice Hockey U20 World Championship Division II Group A on home ice in Tallinn. Sweeping through the tournament undefeated, Estonia needed only four games to clinch top spot. The Estonian U20 national team will move up to the Division I level for the first time since 2009. The Baltic nation struck gold courtesy of a 7-2 win against Korea in front of 1,730 inside Tondiraba Icehall to win promotion to Division IB. Estonia had earlier in the tournament edged Spain (2-1) in their opener, overcome top-seeds Lithuania after penalty shots (2-1) before downing Great Britain (5-2) during day three. The 2-1 shootout win over their Baltic rival Lithuania proved to be crucial as the Lithuanians are second three point behind Estonia but cannot overtake Estonia anymore as the head-to-head game would serve as tie-breaker. “First of all this win is a testament to the good work we’ve done over a number of years. If we look at the bigger picture, the Estonian Ice Hockey Association has done a good job, offered players opportunities to play elsewhere. Looking specifically at this team, we have a strong team mentally, always staying positive and our level of performance is high. We only conceded six goals in four games and defended really well throughout the tournament,” said Estonia’s U20 head coach Simo Luukkainen. Seven different scorers with all four lines being on the scoresheet in their final day 7-2 win against Korea is a testament to Estonia’s team-effort. Against a battling Korean team, it was far from plain sail for the hosts, who required a final frame five-goal splurge before sealing their gold medals with one game to spare. Despite emphatically outshooting their opponents 41-16, Estonia needed to wait almost half-way through the game to break the deadlock against Korea. Rasmus Kiik had seen his one-on-one saved by the Tae Kyung Kim before Christofer Jogi hit home the rebound for Estonia’s opener at 28:26. Estonia captain Ed Slessarevski rounded Kim’s cage and picked out Emil Svartbro, who doubled their lead before the middle frame was over. But nerves crept back into the game with Estonia’s Slessarevski given a major and game misconduct penalty for boarding 40 seconds into the final frame. Korea needed only 24 seconds to convert with a goal by Seokhwan Kim at 41:04 after Oliver Soovik had saved Beomjun Park’s effort. 64 seconds later Korea rejoiced again as Geon Woo Kim potted home a Geonho Jin shot to silence the expectant home crowd. “Korea got back to 2-2 but we knew that we needed to win. With so many of our players carrying injuries it was important that we got it done today and we managed to turn it back into our favour,” said head coach Luukkainen. With plenty of time left on a man-advantage and with Korea surging ahead for more goals, they got punished by a deadly Estonian breakaway. Tommy Jansson picked out Morten Arantez Jurgens. On a two-on-one the latter fed Andre Linde, who put Estonia back in front whilst playing shorthanded at 43:15. Following a Korea timeout, Junkyung Yang sailed through the Estonian defence but was denied by Soovik, before Estonia once again took control of the game and never relinquished it. At 47:30 Jegor Nevzorov combined skill and speed as he picked up the puck in front of Soovik’s cage and weaved himself through the entire Korea team for Estonia’s fourth. With Korea running out of steam, and Estonia being on a two-man-advantage, towering Saveli Novikov powered a bullet past Kim. The 5-2 marker arrived just 33 seconds later as Kirill Lodeikin added further gloss with his power-play goal before Dilan Savenkov closed the scoring 7-2 with 7:40 left of the game. With a place for the 2020 IIHF Ice Hockey U20 World Championship Division I Group B now sealed, head coach Luukkainen looks ahead of what is to come with plenty of optimism. “Each player must now work hard every day to become a better player – physically, tactically and technically. We defended well, but we can also improve our attacking play as well as everything else in our game,” continued head coach Luukkainen. Scoring a brace against Great Britain and converting one of Estonia’s two penalty shots against Lithuania, 18-year-old Artemi Aleksandrov praised the togetherness of the team as a contributing factor to their success. “I didn’t think about scoring points, I just wanted to win the gold medal. Everybody on the team works hard and our coach works well with the team. We are very friendly with each other. Nobody is yelling at each other, so it is a great thing and it was so nice to play for Estonia at this tournament,” said Tallinn-born Aleksandrov, who plays his hockey in Sweden for Rogle Angelholm’s U20-team. In just over three months’ time the Tondiraba Icehall will play host to the 2019 IIHF Ice Hockey World Championship Division I Group B. With Estonia last year finishing a fine third, the feel-good factor is hoped to continue with more juniors also finding their way into the senior national team fold. One such player hoping for a call-up is 18-year-old Aleksandrov, who made his debut for the senior national team last November at the Baltic Challenge Cup played in Vilnius, Lithuania. “It was very interesting to play at senior level. When it comes to speed I didn’t feel too much difference, but the senior players are hitting hard and shoot better. But I don’t want to say anything about the upcoming senior World Championship apart from that I hope I am going to make the team,” said Aleksandrov. With the 2019 IIHF Ice Hockey U20 World Championship Division II Group A entering its final day of games on Saturday there is still plenty left to play for. Lithuania, Romania and Great Britain are all in contention for a medal, while Korea still has a glimmer of hope to climb above Spain and beat the drop.